Robert Dennistoun Esqre, Plan No 1, labelled: Gates, Coachouse, Stable, Stable Court, Pump (twice), Saddlery, Byre, Sow House, Sow Court, Trough (twice) Dung Pit Open, Dung / Pit / Closed, Poultry, Rabbits, X door to take [illegible], No 2 Front next Mews, No 3 / Section through Stable Court / & Harness, No 4 / Section through Stables & Stable Court, No 5 and dimensions given. List as follows: Coachouse 9 by 16 / Saddles 6 / 16 x 10 / Stables 16 x 23, Byre 7 by 10 / Necessary 2.9 by 5 / Sow Court 3:6 by 10 / Sow house / Dung pit open / do close Qy [query] / Poultry 7 by 8 / Rabbits 7 by 3:6 / Court 23 by 55 / (next to a pencil list of the same but without dimensions). 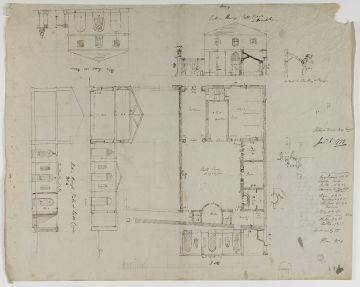 The drawing is by Soane who numbers parts of it (1,2,3,4,5) to indicate what is to be separately drawn out by Seward. The design is for a single stables, later drawings are for twin stables. The inclusion of quarters for rabbits, poultry and pigs (sow house and sow court) was perhaps for the enjoyment of the numerous Dennistoun children - or to be eaten?